They stand behind a blue cart, piled high with jars of jam and chocolate, as well as bananas, sugar and condensed milk. The owner is Philippe Dounaevsky, 54. Originally from Paris, Philippe’s passion for pancakes took a turn into the business world after he moved to Thailand and introduced the dessert to his girlfriend. “I wanted to work in Thailand, and thought that maybe if I worked at the night market, I could make a successful business. After the disappointment, some of his French friends who had settled in Cambodia suggested he might move to Phnom Penh to set up the business. And so he did. Six months later, he and his girlfriend finally started their first business in the capital. 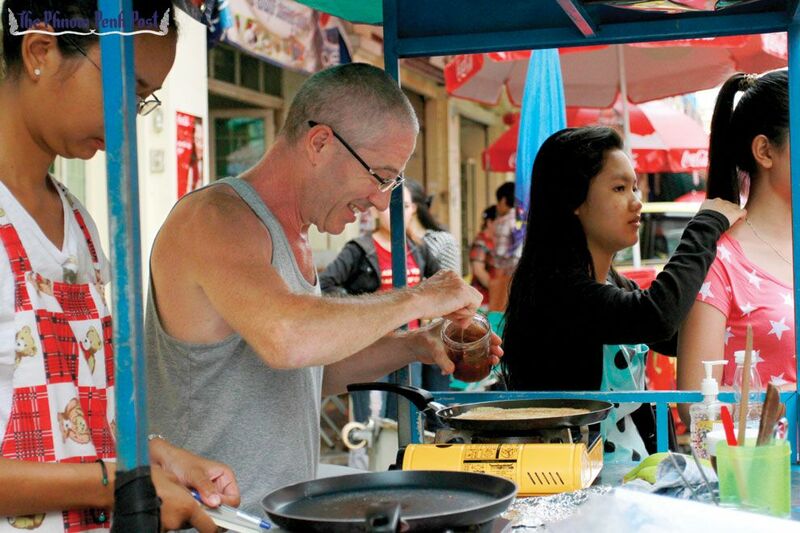 They set up a pancake stall at the night market with just a frying pan set up on a motorbike. Later, they relocated to the French Lycée near the US embassy before settling on the current Street 149 spot. Teenage Keo Lavigne, who studies nearby, helped to translate for Philippe when he first arrived. She said Philippe’s sense of humour as well as the tasty pancakes have made her a loyal customer. Her favourite flavour is the condensed milk variety. “I come to buy pancake whenever I see him selling,” she said. Philippe’s recipe is based on years of watching his mother cook them. He knows how the perfect temperature at which to fry the batter, he said – not too hot, not too low. Pancakes (or crepes) were once a common sight on the streets of Phnom Penh in the early 20th century, during the years of the French protectorate government, with many coffee shops selling the dessert to cater to the French population. Despite the known fondness for the dessert, Philippe was surprised to see his business take off. The proof is in his success, he said.